Riddles in the Dark: Hobbit Day...bleh. Smeagol is soooo excited for Baggins' birthday. Yes precious, look at how excited we are. 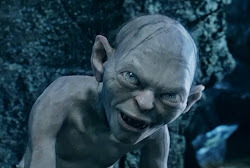 Grr...the short blogger wants us to write a post for today, but we hates Baggins! We doesn't want to celebrate its birthday, especially when it takes our birthday present. He tricks us, he cheats us! We will make a list, yes precious? Reasons why we hate Bilbo Baggins! 1. He stole our Precious! 4. He stole our Precious! 8. He stole our Precious! 12. HE STOLE OUR PRECIOUSSSS! Good list Gollum! If Bilbo did that to me I would be hate him too. Yes, it understands us! We hates Baggins forever! Our heart, poor Smeagol's heart, yes, broken, all broken. Baggins doesn't care. He takes our Precious. He takes it away from us. Breaks Smeagol's heart.